Back in my school days, I really, really wanted to take mechanical drawing but was discouraged as back then (I'm revealing my age) only males took this class...rather...I was forced by my advisor that cooking was a basic essential for all females. Yeah right! I almost flunked Home Economics...It was my lowest grade during my entire 3 years in High School! Till today, I can't cook to save my life! I can still burn water! Here is one of several mishaps in my thick novel of cooking disasters! COOKING DISASTER 2.1: "Rock Hard Hen"
My ex-coworker gave me an easy "fool-proof" recipe for Chinese Shoyu Chicken that her 9-year old could make without any problems. Well...I also screwed that one up as well. Reading the recipe verbiage very carefully...I thought it said to boil chicken in the sauce for 30 minutes. Well after 30 minutes...all the soy/ginger sauce had completely evaporated to a thick black crusty film and my chicken turned out charcoal black as well and hard like "Rock-Hard Jerky" and the whole chicken was literally petrified and stuck to the bottom of my pot, even when turning it up-side-down! I ended up throwing the pot away! I didn't realize as it wasn't "clearly" written in the recipe, that I had to bring the chicken in the sauce up to a boil then simmer for 30 minutes. :oP I guess the recipe wasn't "Fool Proof". LOL! When I was about 14, I think, my parents went away for the weekend and left me in charge. I had been babysitting for my brother and sister since I was 11, but this was my very first time to babysit overnight. So I felt very "grown up" for that weekend. For our dinner on Saturday night, I decided to make beef and gravy (this came in a can, already made, and needed only to be heated up). To go with it, I thought mashed potatoes would be nice. So I peeled and cut up some potatoes and boiled them until they were done, and then I mashed them with a mashing tool as I had seen my father do. (They didn't yet have those dried potato flakes that you reconstitute with water to make instant mashed potatoes, so I had no choice but to do it the legitimate way.) So I put the hot beef and gravy on plates, and then added the mashed potatoes. The result was pretty awful because I didn't know you had to drain the water off before you mashed the potatoes. What a watery mess. PS. I made my brother and sister eat it. We all choked it down, somehow. LOL! The imagery of trying to eat the watery mashed potatoes with a fork left me with a sore stomach from laughing VA_in_CA! You could have fooled your younger siblings into believing it was a "potato soup"! Yuck. Even as soup it would have been disgusting. Besides, it was already on plates. I was lucky, though. I got to make all my cooking mistakes trying them out on my poor siblings or myself. In 1964 I bought a house and moved out of the women officers' quarters. (I was a pioneer in those days because young single women did not buy houses. I was 25.) It was such fun having my own house and land. I puttered around in the garden and played around with recipes in the kitchen. I enjoyed cooking in those days. Not so much any more. It's very boring to cook for one now. But I was actually pretty good at it when I was married with a family. I would invent my own recipes, even. Another time, I'll tell you of a non-cooking, garden-related disaster that was also caused by my ignorance. But now it's almost 3 AM, so I"m going to bed. I have actually become a very decent cook. However, there was the time when my son and I first moved out of my parent's house. My first attempt at meatloaf. I gathered all my ingrediants, including a touch of white vinegar which my family has used for years. I made the meatloaf and was very proud of myself. Let me tell you, my son was the pickest eater on the face of the earth. I always eat my vege- tables first. He just sat there. I repeatedly told him to eat his meatloaf (he did not eat vegetables). He had taken several bites before I got to mine, and let me just say this. I said "Dakota, take the meatloaf outside and give it to the dogs". The next morning he came running in my bedroom and said "mom, mom, the dogs didn't even eat it!!" It took me many years before I attempted it again. That's pretty funny. Wonder what you did wrong. One time we went camping at the beach for Thanksgiving Weekend. I brought a nice baking chicken about 2 to 3 pounds, and the big heavy kind of aluminum foil. I wrapped the chicken in the foil and put it right into the embers of the campfire and let it cook for a couple of hours. Unfortunately not enough meat cooked, so we just had veggies and stove top stuffing. The chicken was crispy on the outside, cooked for the outer half inch, and the entire rest of the chicken was completely raw. It was embarrassing. And worse, we were all starving from all that fresh salt air. To this day my son won't even try my meatloaf. Even though its quite good now. Yes it was the vinegar. There's a reason you measure that crap! Chicken seems to be difficult at times for me too. COOKING DISASTER 2.2: A "Blackened" "Thanksgiving" "Disaster"! "brilliant" idea to raise the temperature of the oven thinking that the turkey would roast faster and get done in time...bad decision! Last roommate left during exams. Nothing in frig. No money... At 17 what do you do. Tried to eat it. No go. Gross! Ahh! I love Edamame! But Raw??? UGH! >:oP I guess you didn't have a microwave back then... Did you have a hotplate and a pot for boiling? Any salt or garlic salt? Raw...cringe! A NEW TWIST ON "TWIRLING CANDY"! Foodini, ChefJet Pro by 3D Systems, Candy, Bocusini, and Barilla! 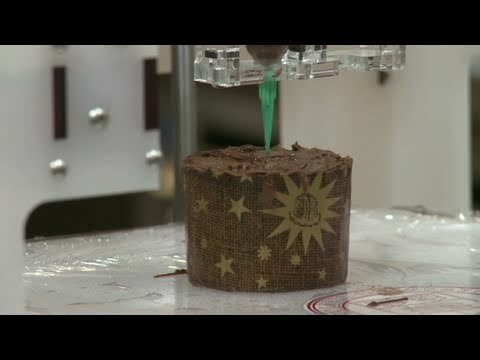 World's First Chocolate 3D Printer! 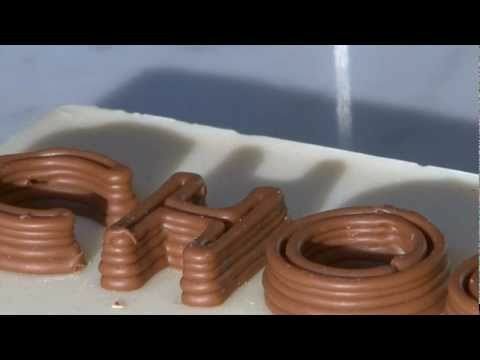 3-D Food Printer Makes Dessert! My family nickname is 'The Chef,' so I'm no kitchen neophyte. But once, after having made my best pie crust ever, and filling it with green tomatoes (’cause we had a ton of them), I ended up with something that tasted like...ketchup pie. Then there was the grape jelly that never set. Because I had used salt instead of sugar. Cured me of storing stuff in mason jars unlabeled. One of my first years married, I had prepared a ham for Easter. Plugged in whole cloves by hand throughout the rind. It was very good. Problem came when my new husband wanted Split Pea and Ham soup. I got the recipe from his mom and followed it exactly. Problem was....she didn't know I had the whole cloves in the rind and I didn't know I was supposed to remove them! Consistency was good and very aromatic! But completely inedible! I have a confession. While cooking dinner tonight, decided to check out facebook and this site. Thought my organic carrots/vegetable smelled kind of funny. Went to check, nope still raw. Must be the different kind of oil I used so I decided to flip them over. The other side was black. We had green beans instead! Do we want to reccomend cooking sites here too? I can, but don't want to change objectives of thread.